United Bank, conducted Tuesday, pumpkin contest (Wayana takit) for clients of the Bank at the Bank's main prize winner gets the 2017 model vehicle. 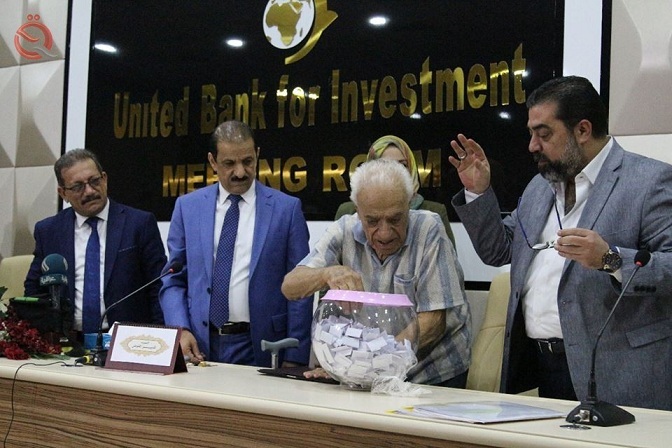 "Noting" clause contest to have the customer at least deposit (250) thousand dinars in his account and run the draw every six months during which selection is a prize winner of a saloon model 2017." He added that today is a prize winner in the Bank branch number 459. Dabbas noted that "Bank seeks its development through the introduction of modern information technology in his work bringing Arabic banks and international refineries in accordance with standards set by the Central Bank to banks operating in the country." "of course, the guy preparing to draw the winning ticket is studying the tickets as he looks down into glass bowl before he draws the winning ticket "
LOL you know it ikea !! !